Hey...Packer fans. Brett Farve would not have helped you this season. No he wouldn't. Awful nice for Randy Moss to finally show up some time in the 2008 season. And yeah, you could say, well Tom Brady is out and he has to adjust to Matt Cassel, but if Wes Welker is doing it why isn't Randy? Norv Turner....dude....you better get Phil Rivers a biiiiiiiiig fruit basket for Christmas this year, because he just saved your job. Maybe. Still, ole Norv if he gets fired, probably works next season. He'll probably turn up as a offensive coordinator next year—maybe in Jacksonville or Cleveland—which is his best calling. He's very good at guiding quarterback and offensive gameplans, just not running the whole show. So, let me get this straight. Auburn fires Tuberville, who was 85-40. And replaced him with a guy who went 5-19 at Iowa State? And after they have serious offensive problems, they hire a guy who was famous for running defensives? How is this a plan for competing with Nick Saban and Alabama? 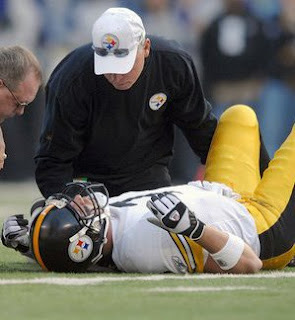 If the Steelers don't draft a offensive lineman in round 1 next year, they should just get Big Ben a Preferred Customer card to the local hospital. How cute that Kenny Lofton tried to steer away from the Yankees. Yeah, I can see Sabathia pondering the situtation; "On the one hand is a team willing to pay me 160 million dollars to throw a ball, and a good chance to win a couple of World Series. On the other, Kenny told me that sometimes people can be mean in New York. Tough choice." That was some cushion Samari Rolle was giving in the Steelers 4th quarter drive yesterday. He may as well have been in Pittsburgh with the cushion he was giving. Seriously, he was playing off his man, something like 15 yards. Predict Ravens go CB in Round 1 of next year's draft. If Andy Pettite doesn't come back to New York and Derek Lowe goes elsewhere, I wouldn't be a bit surprised if the Yankees go for Jake Peavy with a package involving Ian Kennedy. And get him. In one of the easiest Andaplayerotbenamedlater's Man of the Week Awrd's ever, the award goes to DeMarcus Ware. The guy seeming set up a campfire in the Giants backfield, with 7 tackles, 3 sacks, and blwoing up even more running plays for his teammates to clean up. Easy choice, DeMarcus, congrats. And finally, a friend of mine—a big Rays fan—wants to point out that Evan Longoria is very, very good. I think Wes Welker makes it easy on the QB to get him the ball because he runs shorter routes (and runs them well). Cassel does not throw the ball down field nearly as well as Brady, which may explain why Moss hasn't had a money year. I despise Randy Moss, but I don't think he's been dogging it (a lot, anyway). Good point on Turner - he's not a head man. Auburn succeeded in getting Charles Barkley's attention for the wrong reason. This better work out, cause the resume on their choice is suspect and Turner Gill was passed over. It seems like 6 months ago Aubern was awesome. If I'm Clemson I beg Tuberville to take the job. Great job, P-Cat, as always.